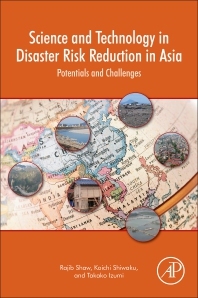 Science and Technology in Disaster Risk Reduction in Asia: Potentials and Challenges provides both a local and global perspective on how to implement the Sendai Framework for Disaster Risk Reduction. Topics demonstrate the advancement of scientific research as it applies to early warning systems, including identifying risk and the strengthening of infrastructure for different types of hazards. Through different major disasters, it has become evident that there must be a balance between hard and soft technology and physical, process and social solutions. This book demonstrates how this has been successfully implemented in Asia, and how these applications can apply on a global basis. Rajib Shaw is Professor in the Graduate School of Media and Governance in Keio University, Japan. He has worked closely with the local communities, NGOs, governments and international organization, including United Nations, especially in Asian countries. His research interests are: community based disaster risk management, climate change adaptation, urban risk management, and disaster and environmental education. He is currently the member of UN ISDR Science Technology Advisory Group (STAG), and Co-chair of UN ISDR Science Technology Academia Stakeholder Group. Professor Shaw has extensive publications in different journals, books and edited volumes. Koichi Shiwaku is a Researcher in the Graduate School of Global Environmental Studies of Kyoto University, Japan. He has been working with central and local governments, NGOs, school teachers and students, and local communities in Japan and overseas countries. His recent works are enhancing school disaster resilience and capacity development of officers of board of education in the area affected by the 2011 Great East Japan Earthquake. His research interests are disaster education, community based disaster risk management, governance for disaster education, school safety, and capacity development of local government. Takako Izumi is an Associate Professor in the International Research Institute of Disaster Science (IRIDeS), Tohoku University in Japan. She also serves as Programme Coordinator of the Multi-Hazards Programme under the Association of Pacific Lim Universities (APRU) that consists of 45 universities and academic institutes in the Pacific Lim. Her research interests include international and regional framework of disaster risk reduction, disaster risk reduction at local level, and role of civil society in disaster management. Previously, she worked for the UN Office for the Coordination of Humanitarian Affairs (UNOCHA) for the disaster response coordination in Asia and for one of the international NGOs in Malaysia as General Manager to oversee the programs of disaster response and disaster risk reduction.